This satisfying meal came together really quickly and easily for a great weeknight dinner with some simple shortcuts. A jar of sauce helps speed the pasta along, and I had proofed a thawed dough ball (from a local pizzaria) that I had frozen in the freezer. 1. Set a large pot of salted water to boil. Cook pasta according to box directions for al dente texture. 2. Meanwhile, pour jar of pasta sauce into a saucepan with 1 c. of TVP, 1 c. of water, and a veggie bouillon cube. Add Italian seasoning, salt & pepper, and crushed red pepper flakes, if using. Heat until bubbly over medium heat. Cover and simmer on low until pasta is ready, adjusting seasonings to taste. 3. Drain pasta and return to pot. Add sauce and nutrtional yeast, and combine. 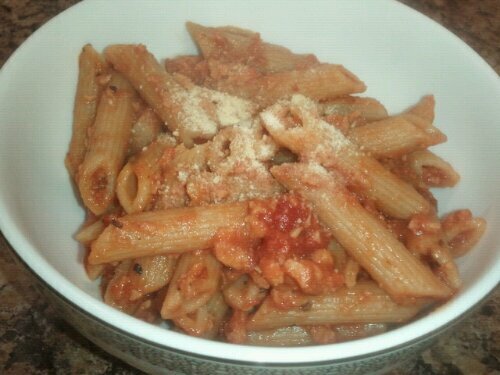 Top individual portions with vegan parm. 2. Roll out pizza dough and score with a dinner knife without cutting all the way through. Spray with olive oil and sprinkle lightly with garlic powder. Cover generously with shredded cheese and bake for 10 minutes.